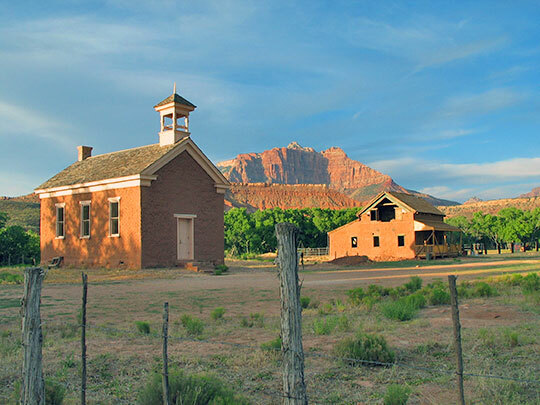 Photo: Two of the last remaining buildings of Grafton, Utah, a ghost town. The schoolhouse was built in 1886, it was also used as a church and public meeting place. Rockville, UT. The Grafton Historic District was listed on the National Register of Historic Places in 2010. Photographed by User:Triberocker (own work), 2009, [cc0-by-1.0 (creativecommons.org/publicdomain/zero/1.0/deed.en], via Wikimedia Commons, accessed August, 2013. Washington County administrative offices are located at 197 East Tabernacle Street, St, George, UT 84770; phone: 435-634-5712. Located in the southwest corner of the State of Utah, Washington County—also known as Utah's Dixie—has a low altitude, and a warm, dry climate. Its scenic resources make it attractive to visitors and travelers using the highways and freeways through the area. Zion National Park's spectacular scenery was formed by the Virgin River; a part of the Colorado River Basin, Snow Canyon, with its beautiful Redrock canyon was part of Dixie State Park. While the first settlement of Washington County was at Fort Harmony, the earliest pioneers were sent to the area by Brigham Young to grow cotton for the territory. The first experimental crop was planted in the spring of 1855. Two years later, the town of Washington was established, and the only cotton mill in the northern states, or territories, was established. The "cotton mission" was strengthened by the arrival in 1861 of 300 families led by George A. Smith and Erastus Snow, two important leaders of the Latter-Day-Saints, or "Mormon" Church. The city of St. George, now the county seat, was named after George A. Smith. A number of pioneer buildings still stand throughout the region, and have been restored including the Opera House, Art Museum, the Pioneer Museum, and a number of pioneer homes. The growth of the county has been reflected in the development of its educational institutions. The first schools were in wagon boxes before houses were begun. Four regional schools were built with the first at the town of Virgin. In 1901 a central school was built offering two years of high school. The St. George State Academy was founded in 1911 and originally included only one building. That institution has grown into Dixie State College, located on the site of the original wagon settlement of St. George. It is a State College offering a number of four-year degrees with the potential of much further growth and expansion in the future. Washington County, Utah Board of Commissioners, Planning Commission and Public Works Department, The General Plan of Washington County, Utah 2010, amended, 2012, www.washco.utah.gov, accessed August, 2013.